Unexpectedly, “Stranger Things” captured America’s collective fancy last summer. The science fiction drama triggered conversations on the Upside Down that went round and round, countless PR sightings of the then-unknown cast of too-adorable kids, and a kitschy call for justice for the loyal, forgotten, and, alas, quite dead Barb, the show’s beloved fringe ginger. Inspired by the Duffer Brothers’ obsession with 1980s movie nostalgia, filled with sweetly witty allusions to the likes of “Goonies,” “ET,” and “Stand by Me,” the Netflix show wasn’t quite as good as its hype — especially as the first season, like its young hero, Will Byers, became increasingly mired in gelatinous nonsense. Story-wise, the drama didn’t build up so much as subside into sci-fi baloney about a monster dubbed the Demogorgon, a deep government conspiracy, a parallel universe, and slimy slugs. I like sci-fi baloney — made of finely ground plot fat — about as much as I like baloney in a sandwich, which is to say not at all. But season two of “Stranger Things” has taken me by surprise. The first five new episodes are better than most of the first season; they’re more emotionally developed and resonant. Because the first season revolved around a crisis — the disappearance of Will (Noah Schnapp) — the pace was fast and the emotions heightened. In the case of the cryfaced Winona Ryder, who plays Will’s mother, Joyce, it was far too heightened. This time around, there’s no pressing catastrophe drowning out the characterizations; the whole show seems to have room to breathe. The familiar denizens of Hawkins have more dimension this time, particularly the kids, as do the newcomers such as Sean Astin as Joyce’s new boyfriend and Sadie Sink as the new kid in town, Max, who starts hanging with the gang. The action picks up a year after the first season; Will and, to some extent, the rest of Hawkins all have a bad case of PTSD. 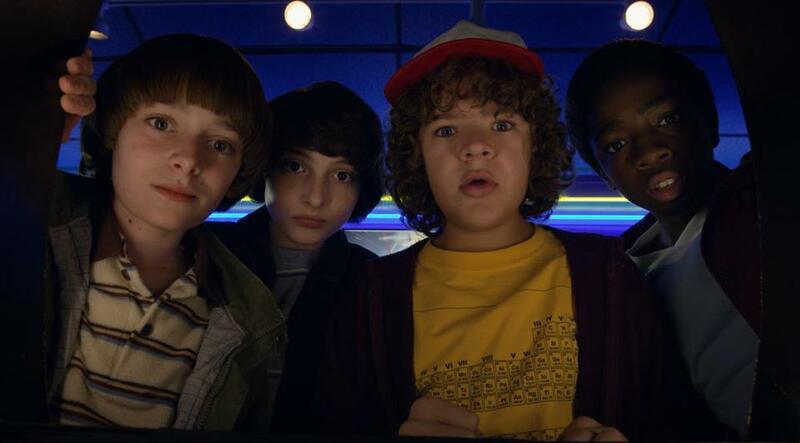 Will is still hanging with his Dungeons & Dragons mates Mike (Finn Wolfhard), Lucas (Caleb McLaughlin), and Dustin (Gaten Matarazzo), and they spend an inordinate amount of time at the local video arcade — but then Will is having devastating flashbacks to his time in the Upside Down, and Mike is pining away for Eleven (Millie Bobby Brown), whom he kissed in the first season finale. By the way, almost everything somehow ties back to the events of the first season, if you were thinking of jumping into the series midstream. The big theme — the way trauma lurks long after it has been inflicted — requires that. There is even a Barb-related plot that, like everything spoilery, I will not detail here except to say that it involves the older teens, particularly Barb’s friend Nancy (Natalia Dyer). Season one served as a breakout for actor David Harbour, who is back as Jim Hopper, the weary chief of police. Again, no spoilers, but Harbour gets to expand the scope of his character this time in surprising and appealing ways. Same with Brown, whose Eleven goes on a journey of her own — in search of an identity — that is central to the season. Eleven is the emotional core of the show, the one whose victimization seems cruelest. On “Stranger Things,” the parents tend to be kitschy and somewhat clueless figures — Dustin’s mother, for example, is oblivious to the otherworldly pet her son keeps in his room, while the kids, with their innocent bonds and their brave rescue attempts in the face of nightmares, seem more alive and aware. By the way, that pet, which, as one of the gang says, looks “like a living booger,” figures prominently in the season. One of my favorite elements in “Stranger Things” is the editing. Watch the way the scenes are knitted together, with perfectly timed abruptness and clever juxtapositions. It’s all intertwined carefully, wisely, affectionately, and, I hope, with as little baloney as possible.